Compatible with automatic placement equipment, PFC Divider Series is available with TaNFilmÂ® Tantalum Nitride technology or Tantalum Ultride(TM) technology. TaNFilm unit has power rating of 250 mW and provides resistance range of 10 W to 150 kW, while Tantalum Ultride unit features power rating of 50 mW and resistance from 1-50 KW. 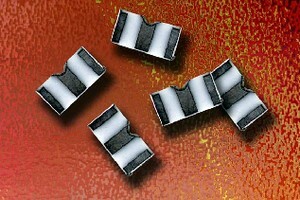 Both include wrap-around terminations with non-leaching nickel barrier. CORPUS CHRISTI, TX (August 24, 2007) - Providing design engineers with a device suitable for precision and ultra-precision applications, TT electronics IRC Advanced Film Division offers their precision chip voltage divider with either Tantalum Nitride (TaNFilm®) technology for precision performance or Tantalum Ultride(TM) technology for ultra-precision and high stability circuits. Designated the PFC Divider Series, both versions of the voltage divider are offered in a 1206 package compatible with automatic placement equipment. "While our TanFilm resistive elements provide superior environmental performance and precision, our Tantalum Ultride technology takes that a step further with the exceptionally tight TCR, tolerance and stability specifications," said Jerry Seams, applications engineering manager for IRC Advanced Film Division. "By offering the device in both technologies, we are able to provide our customers with a single package solution for any voltage divider application from voltage converters and references to precision gain and frequency control. The TaNFilm® voltage divider is ideal for battery monitoring, voltage references, voltage conversion, voltage regulators, logic-level conversion, DC/DC converters and power supplies, as well as COTS applications. The Tantalum Ultride voltage divider is specified for high stability applications including medical CT, MRI, PET and ultrasound equipment; petrochemical equipment such as exploration and data logging instruments; instrumentation and test devices including DMMs, measurement bridges, strain gauge circuits and input attenuators; as well as military avionics and missile guidance. The TaNFilm PFC voltage divider features a resistance range from 10W to 150KW, with a package power rating of 250mW. The divider has a maximum voltage rating of 100V, absolute TCRs to ±25ppm/°C, and TCR tracking to ±5ppm/°C. Operating temperature range is -65°C to +150°C. The PFC voltage divider with Tantalum Ultride technology features a resistance range from 1KW to 50KW, and a power rating of 50mW. Absolute TCR is to ±10ppm/°C, with TCR tracking to ±1ppm/°C and absolute tolerance to ±0.02%. Ratio Stability at 70°C ambient is better than 50ppm over 1,000 hours at rated power. Operating temperature range is from -55°C to +125°C. IRC will also produce devices outside these specifications to meet customer requirements. Both versions of the voltage divider feature wrap-around terminations with a non-leaching nickel barrier, and are available with standard Sn/Pb terminations or 100% tin (Pb-free). Pricing for the PFC Divider Series voltage divider is $0.78 at 1,000-piece MOQ. Lead time is from stock to 9 weeks. For datasheets or more information on IRC's PFC Divider Series, please access the Web site at www.irctt.com/products.aspx?frmCategory=45. For additional information, please contact the TT electronics IRC Advanced Film Division Sales & Marketing Department at 361-992-7900; via mail at 4222 S. Staples St., Corpus Christi, TX 78411; or e-mail at afdsales@irctt.com.